Citibank credit card gives the customer the freedom to buy anything anywhere without worrying about money in hand. An added benefit is, it also provides the cash withdraw feature for a small fee and interest. Make any cash-less transaction within customer’s assigned credit limit and pay later. 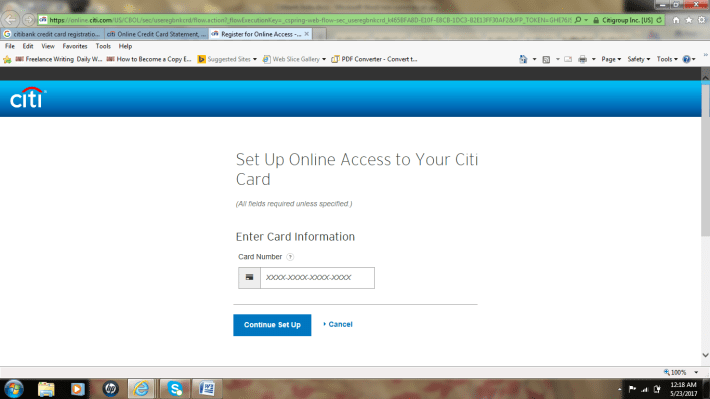 Citibank credit card can also be used for online transactions. The best part is the credit period is available free of interest. Citibank credit card provides two different cards for domestic and international use with certain restrictions. International Citibank credit card is the best option for an international travel. Apart from enjoying the card associated benefits, having the Citibank credit card helps customers obtain instant loan approval. Extend the benefits of the credit card to customer’s family members using the Citibank add-on credit card service. To register for online access to credit card, the customer has to provide the primary card holder’s date of birth and the last four digits the Social Security Number. In the case of customers without a Social Security Number, the zip code of the billing address registered with the bank has to be provided. After providing the User Id and the Password, click the “sign on” button to access the account. 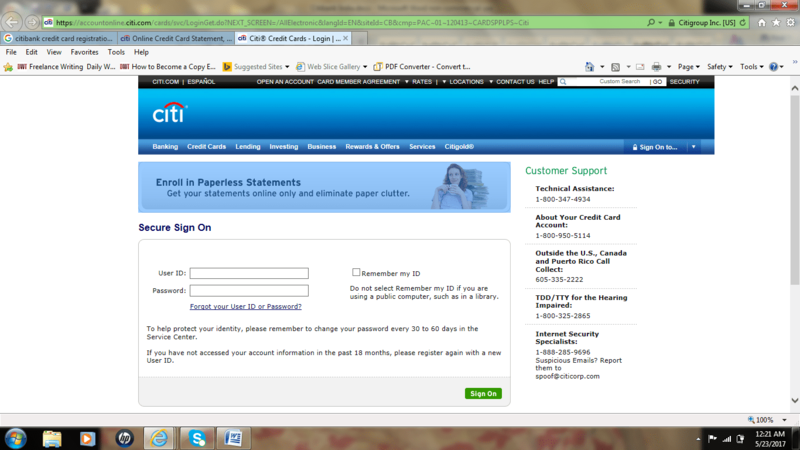 If you have any doubts regarding registration you can contact Citibank Customer Care. The different varieties of cards provided by Citibank for its Indian Citibank Account holders are Indian Oil card, Rewards card, Premier Miles card, and the Cash Back card. Each of the cards provides a unique set of benefits. Few services available with these cards are free and remaining others can be availed by paying a small fee or extra charges. Every time customer uses a Citibank card, they can enjoy exciting reward points that can redeemed at a later date. 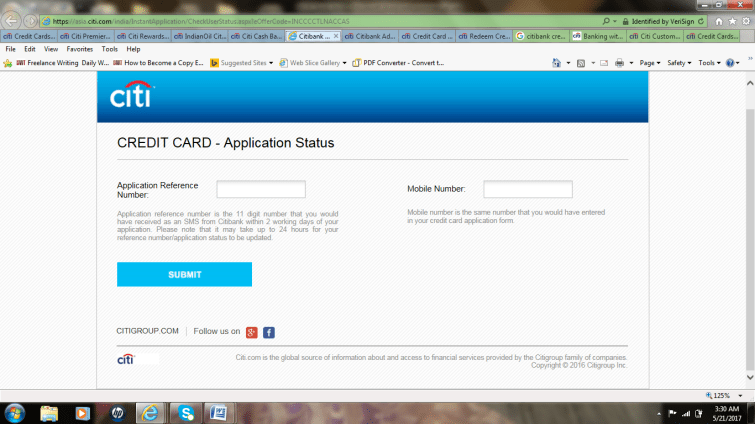 Applying for a Citibank credit card online is simple and easy. Click the credit card tab available on the menu bar on the home screen. Choose from the available type of the cards, the card that best meets customer’s requirements and click on the Apply for a credit card button provided to the right of the cards list. Before selecting the card, do not forget to check for the fees and charges for using the card.You can also apply for Citibank Debit Cards for more offers on online usage. Once the Apply button is clicked, an application form requesting the customer to provide the various personal details such as email ID, date of birth, the profession will open. Fill the application and click the Submit button at the end. The online application form looks as below. An 11-digit application reference number will be provided to the customer within two days of submitting the application. After receiving the reference number, the customer has to wait for about 24 hours to check for the status of the application as the status information will be updated during this period. Citibank online credit card payment can be made without any hassles using the online bill payment service, phone banking or the NEFT services. Customers are also given the option to provide standing instructions, saying to deduct the credit card bill from the Citibank account. Other modes of payment of the Citibank credit card bill are NEFT, RTGS, ECS (Electronic Clearance System (ECS). The credit card bill can also be paid from bank accounts other than the Citibank using the visa money transfer (VMT) service, and from other bank websites. This type of Credit cards payment process is same for the following banks Punjab National Bank Credit Cards, South Indian Bank Credit Cards and Kotak Mahindra Bank Credit Cards etc. Customers can obtain information about the different types of credit card, the usage guidelines, and the available payment forms by visiting the Citibank website. Other options for obtaining the required support or help are visiting the branch directly or by contacting the customer care executive on the phone who will be available round the clock. The frequently asked section generally provides most of the required information. Check here ICICI Bank Customer Care, Dena Bank Customer Care, and YES Bank Customer Care for services which provides contact details state wise in India for hassle free banking. A wide variety of Citibank credit card offers are available depending on the type of the card. Here is a list of credit card offers available for different groups of customers. Citibank Net Banking also used to check the offers on credit cards. Avail 5 percent cash back when movie tickets are booked using Citibank credit card. Maximum cash back of up to Rs.100 can be earned per month. Pay telephone bills and enjoy 5% cash back. The cashback limit per month is Rs.100. EMI option is available on purchases over Rs.2500 made using the card. Use the Citibank online pay services, pay utility bills and get 5% cash back. The maximum amount of cash back that can be obtained per month is limited to Rs.100. It should be noted that the bills cover all types of monthly bills whether it is a utility bill or telephone. You can also check here for registration process and offers on Dena Bank Credit Cards, United Bank of India Credit Cards and Bank of Baroda Credit Cards. The cash back amount in all the cases is credited to the Citi Cash Back card upon obtaining Rs.500 cash back. Customers who fail to obtain cash back of Rs.500 in a month, can get it in the next month or whenever the credit limit accumulated to Rs.500. To enjoy the cash back services, it is very important for the customers to maintain the good credit history. In the case of canceling the card, the cash back benefits will be withdrawn. A fee of Rs.500 per year has to be paid in the first month. The fee may be revised every year depending on the card usage. This is a perfect card for frequent travelers as it provides miles on all the payments made using the card. The miles can be redeemed in the form of discounts on flight tickets, hotel bookings and in paying car rental services. For every Rs.100 spent on the card, 10 miles will be provided. Making payments at ww.permieremiles.co.in and with other selected Citibank partners customer can earn 10 miles for every Rs.100. 10,000 bonus miles on spending Rs.1000 using the card within first 60 days of obtaining the card. 3,000 bonus points will be awarded when the card is renewed. The miles obtained can be credited with about 100 international and domestic airline services. The miles accumulated on Citibank card does not expire and can be used anytime whenever needed by the customer. Registering for the Frequent Flyer Program of airline services will fetch extra miles to the customer. The money spent on the Citibank rewards card gives customer reward points that can be used for different transactions such as booking flight tickets, online shopping, bill payments and many. One reward point per Rs.125 spent will be provided for purchases made at stores other than for apparel and departmental stores. Bonus points of about 2,500 will be awarded upon activating the card. 1,500 bonus points are awarded for first purchase using the card within the 30 days of issuing the card. 1,000 bonus points will be provided for Rs.1000 spent using the card within first 60 days of receiving the card. Spend 30,000 or more in one month and get extra 300 points. Waiver of annual fee on spending Rs.30,000 in a year. If you are looking for much better offers on credit cards then the following banks Canara Bank Credit Cards, HSBC Bank Credit Cards and IDBI Bank Credit Cards providing great offers. It should be noted that the points earned on the rewards card never expire. 4 turbo points for every Rs.150 spent on fuel at any of the IndianOil authorized stores. 2 turbo points for every Rs.150 spent at any other retail stores. 1 Turbo point for every Rs.150 spent on dining, online shopping, bill payment and others. Turbo points earned using the card will give free petrol to customer– for every one turbo point, free petrol worth Rs.1 will be provided. The points can also be redeemed at other selected stores. The turbo points can also be redeemed in the form of gift cards from popular brands. Annual fee will be waived if Rs.30,000 are spent using the card in a year. SBI Credit Card also provides the great reward points. Does Citibank Credit has any Validity Period? Citibank credit cards are valid for a period of 3 years or as mentioned by the bank. The card will be renewed automatically, one month before the date of expiry. The same is applicable even for the add-on credit cards. The renewed card has a different CVV than the original card. 2. 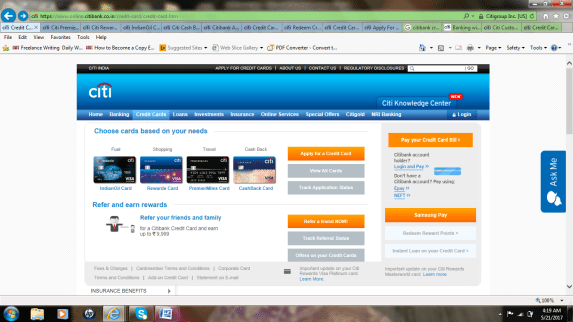 Can a Citibank credit card be changed to a different type of card? Citibank credit card customers are given the flexibility to upgrade the card as per their needs. The card can be upgraded using the phone banking services. However, the customer can enjoy the services of only one type of card. Upon submitting the card, the previous card will be blocked and would remain active for 60 days for swipe transactions. The reward points accumulated on the old card will be transferred to the new card. 3. 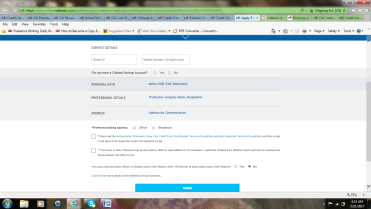 Can the preset credit limit on Citibank credit card be increased? 4. How to reduce the credit limit of the card? Customers who wish to keep their expenses under control by reducing their credit limit can make a request to the bank using the phone banking services or by online by accessing account. Customers should make note that in future, the credit limit will be increased only when a request to increase the limit is submitted. 5. What is the reason for rejecting the card renewal? A credit card may be rejected for renewal when a customer fails to make the card payments, for providing a dishonored cheque, or for not providing the correct contact address. 6. Can credit card bill be paid using the E-pay service? Credit card bill can be paid using the E-pay service, which also provides the flexibility to pay the bills of other Citibank Add-on cards. 7. How to redeem the reward points earned by using the credit card? The reward points associated with the credit card can be redeemed by following any one of the methods: in-store shopping, purchase of a gift voucher, Pay fuel bills at chosen Indian Oil fuel stations, Purchase airline tickets at discounted prices, online shopping at multiple stores. The reward points accumulated by using a specific type of credit card can only be redeemed using only the options available with it. The reward points associated with one card cannot be transferred to another card or can be en-cashed. When a customer updates or renews the card, the existing reward points on the old card will be transferred to the new card.